So, if you’ve ever read our blog, you know that we’re kind of, sort of, ok completely obsessed with whoopie pies (yep, that’s their real name). Since its February, a month all about spreading the love, we figured what better way to celebrate than by making a dessert who very name suggests ….well you get the idea. They are pretty easy to put together, and if you’re willing to share a couple, you’ll get huge props from everybody you feed them to. Seriously. Take these puppies to work and you will be a hero. You’re going to need to get pretty much every single ingredient you own out of your cupboard to make these, but don’t freak out. Quantity of ingredients does not equal the difficulty of a recipe. We promise. In the bowl of an electric mixer, beat together cream cheese and butter at medium speed. Reduce speed to low, and add sugar. Add vanilla, bring back up to medium speed and beat until creamy, about 4-5 minutes. Right about now you are probably looking into the bowl of your mixer thinking: holy Moses- that’s a ton of filling! You would be right. But here’s the thing. Skimping on filling is never EVER acceptable. Better to have too much than too little. Preheat oven to 375, and line a baking sheet with parchment paper (you might be tempted to skip this step. Don’t). Sift together flour, cocoa powder, baking powder, baking soda, and salt. 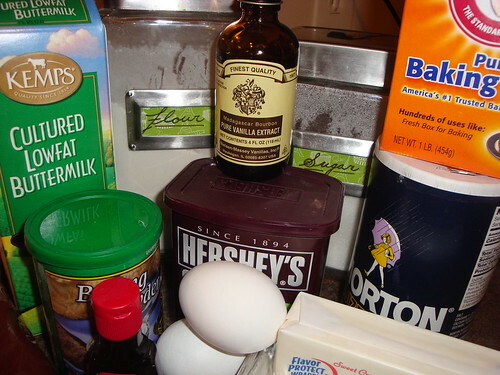 In the bowl of an electric mixer, beat together butter, shortening, and sugars. Beat for about 5 minutes. Add eggs one at a time, beating after each one. Add vanilla and red food coloring and beat until just combined. 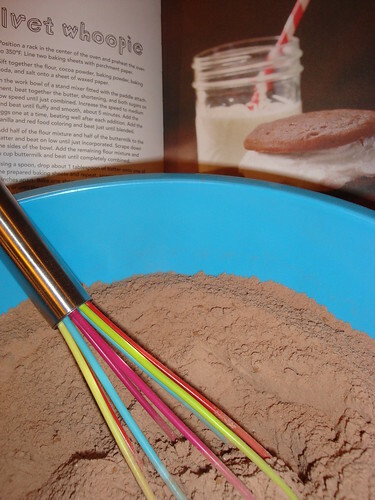 Alternately add flour mixture and buttermilk to the mixing bowl until completely incorporated. Drop batter by rounded tablespoons onto baking sheet, making sure to keep them about 2 inches apart. Bake for 10 minutes, or until toothpick inserted comes out clean. Let cool for 5 minutes. Spread filling on one cake, and top with another, creating a sandwich. Serve immediately. That’s it- that’s all she wrote. Told you they were simple. Now go slap on your apron and whip up a batch of the most fantastic Valentine’s Day treats ever created. p.s. 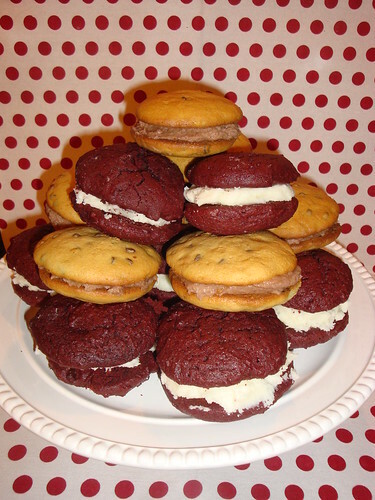 Those very blonde looking whoopies aren’t Red Velvet ones gone horribly wrong. They are actually a chocolate chip flavored version with malted milk filling. Want the recipe? You can get it here.